This Watersafe Pool and Spa Rapid Bacteria Test Kit 10-Pack includes 10 individual test pouches. Save by buying this 10-pack. The individual retail price of a single test is $9.95, so the 10-pack is an amazing value. Inside the 10-pack box are 10 individually wrapped foil pouches, each containing the complete test kit. Inside each pouch, you will find a test strip, water sample vial, a plastic dropper and instructions. These bacteria tests are good for a one time single use each. The instructions are clear and included. Use the included dropper to collect a water sample, then add the water from the dropper to the included test vial. Swirl the vial around and let it stand for about 5 minutes on a flat surface. Then swirl the vial once more and put the included bacteria test strip inside the vial with the arrow pointing down. Just leave the vial with the test strip sit there for 10 minutes without moving it while you go on about your other business preparing for a nice day of fun in the water. After 10 minutes, a little red line or two will appear on the test strip. One line means negative for bacteria, so jump in! Two lines means positive for possibly containing bacteria that could be dangerous to your health. Is your water safe? Find out with the 15 minute WaterSafe bacteria test for your pool, spa, river, lake or horses trough. Get your WaterSafe Bacteria test kits right here at the Hot Tub Outpost. Other test strips we offer include hot tub 4 way test strips, pool sanitizer test kits and even drinking water test kits. You don't really know unless you test the water yourself. Do you trust the health of your family and friends to random chance? The Watersafe® Bacteria Test is an antibody-based rapid test kit that detects the presence of bacteria in swimming pools and spas. The Watersafe® Bacteria Test detects E.coli, Pseudomonas aeruginosa, species of Shigell, Enterobacter, and many other coliform and non-coliform bacteria. RWI stands for Recreational Water Illness and it can affect anyone who goes into water full of bacteria and other harmful substances. RWIs can include stomach aches, ear aches, vomiting, diarrhea, eye irritation and other health hazards. We'll make the young'uns wear helmets, safety vests and seatbelts - and rightly so - but most of us don't take the time to assure that the pool or spa water is safe by testing for potentially dangerious RWI-causing bacteria. 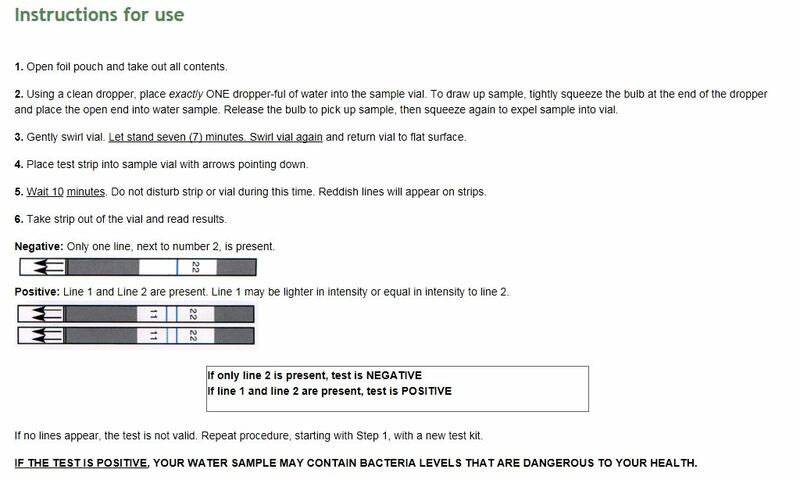 Get the peace of mind of knowing more about the water you swim in by using this easy to use bacteria test for pools, spas and even lakes and rivers. Highly rated product! Some reviewers online even leave some interesting comments - like " something pooped in my pool and I need to make sure it is safe to go back in..."! Get the best shipping right here at Hot Tub Outpost, where we ship your order the same day or latest, next business day so you get your order sooner! We also ship in real boxes, so you won't have a crushed box when you get the package. Thank you Miss Becky for your nice review: "I just wanted to say thank you so much!! My son got e. Coli from a pool two years ago and ever since we have used these strips. We just found out that our vacation rental has a pool and we were out of tests. I was afraid the tests would not get here in time, but they were much faster than expected!! Thank you so very much! I will order again!"